Many people often combines up the words "Insolvency" and "Bankruptcy" presuming them as a same thing. Still these two terms are though equal, but have dissimilar meaning. Insolvency is a monetary situation in which a person or a company can no longer pays its bill in given period of time. It has temporary nature related to the financial state where amount is recoverable. In this term credit rating is also not much effected. It is the state of the economic distress. On the other hand, Bankruptcy is is basically know as when is declared incapable of paying their due and payable bills. In this case, an application filed in the court against the insolvent. A person who is declared as a bankrupt, then will also deemed to be solvent. It has permanent nature related to legal concept. Insolvency is essentially the state of being that cause one to the file for bankruptcy. An organization, a family, person, or company is declared as insolvent when they are unable to pay their debits back on time. Various loans and investment is given by numerous bank, shareholders, secured creditors, etc. In this groups banks are the major creditors that holds the fixed charge on property or other business assets. Typically, a person becoming insolvent can take certain steps towards a resolution. At present there are number of laws dealing against financial falls in India. One of the most common solution for insolvency is bankruptcy. Bankruptcy is a legal decalartion of person who is unable to pay off debits. In generally, Bankruptcy is of two types- Reorganization and Liquidation bankruptcy.Under the bankruptcy of reorganization, debtors should restructure their bill plans to make them more easily met. Where as under liquidation bankruptcy, Debtors has to sell their assets to make money so that they can pay off their creditors. Bankruptcy is the final stage of insolvency, which results in winding up of an individual's assets. In this case, The court itself has to decide the appropriation of the individual property of the insolvent amoung their creditors. 1. Insolvency arises due to non-payment of financial deeds where as bankruptcy cause when a person/company is helplessness for paying off the outstanding debts. 2. Insolvency is declared himself by the person and, In bankruptcy, a person/ company goes to a court. 3. All Bankrupt Individual/organization are insolvent while it is not neccesary that insolvency pilot to bankruptcy. 4. 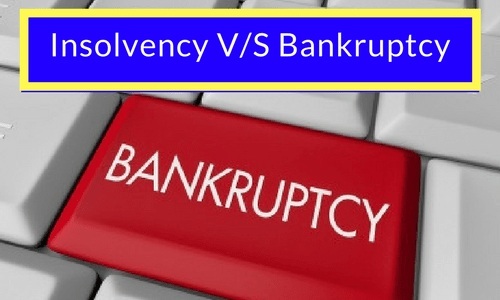 In Bankruptcy, An individual/company becomes bankrupt by legal state of process,whereas in Insolvency, An individual/ company related to financial state becomes insolvent. 5. In bankruptcy assets are totally upset of an individual on the other hand, Insolvency does not. 1. Caused due to non-payment of debts. 2. Assets raises due to the liabilities. These are the two terms considered tight interrelated as one leads to another, where insolvency ends the bankruptcy starts. But it dosen't mean that every person/company who is insolvent is bankruptcy, as conditions are temporary without any legal interventions.